President Xi during his remarks in the country reminded listeners of the long ties between the two countries, including the travel of Marco Polo to China. Italy, with its long tradition of using silk, has a further tie with China, which is where much of this silk originates. The analogy is that China and Italy were part of the old Silk Road, so it is logical for them to be part of the new one. 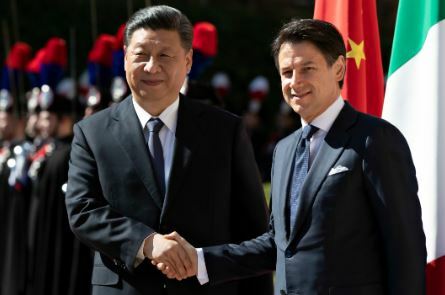 Italy takes this step while the United States is still engaged in a heated trade battle with China, and the European Union has also been toughening it attitude towards China and trade. Earlier in March, the EU Commission released a report labeling China a “systemic rival promoting alternative models of governance.” Likewise, French President Emmanuel Macron decided to invite Germany’s Angela Merkel and European Commission President Jean-Claude Juncker to attend Xi’s state visit to France, in a show of EU solidarity. Italy also garnered criticism from the United States, including a tweet from the National Security Council. Italy was clear in its statement during the signing of the MoU that it expects trade and investment with China to be two-way – and that it is not seeking to be part of the “debt diplomacy” initiative that China has been accused of pursuing. Yet given the state of the Italian economy, and the need to upgrade its much-needed ports and facilities, Chinese financing – especially in light of limited money coming from the United States or EU – is very appealing to the Italians. Italy did also make clear that issues around 5G were not part of their discussions with the Chinese. The global upgrade to 5G and China’s role in it will be an ongoing and potentially very troubling dispute between the United States and other countries, including many in Europe, who are reliant on Chinese telecom equipment. The United States continues to pressure its allies not to adopt Huawei technology, but the commitments from the United Kingdom, Germany and others have not been as solid as the Administration would hope. This debate will get worse before it gets better.